Grow your own Festival Table. Home > Grow your own Festival Table. While we all celebrate Christmas in different ways, the festivities invariably revolve around the feast that is Christmas lunch. With each signature dish and long-held tradition, the festive table is a sight to behold. Cherries from Tasmania, prawns from Queensland, potatoes from South Australia. Our food, just like our families, come from far and wide for the celebration. But have you ever wondered what you could grow in your own backyard to serve up on Christmas? Not only do home-grown veggies reduce food miles, they are fresher, less expensive and often tastier than what you can get in the supermarket. As well as being healthier and more sustainable, home-grown food comes with genuine bragging rights (did I mention that I picked all this just this morning?). With the end of the year a few months away, there’s still time to get your garden ready for harvest this festive season. Here’s a list of what you can plant now to have on your plate by Christmas. Beetroot – In just two months your beets will be ready to roast. If you’re like me and aren’t a huge beetroot fan, blend them with cashews, lemon and garlic into creamy pink dip. The leaves are also extremely nutritious and can be sautéed or tossed raw into a salad. 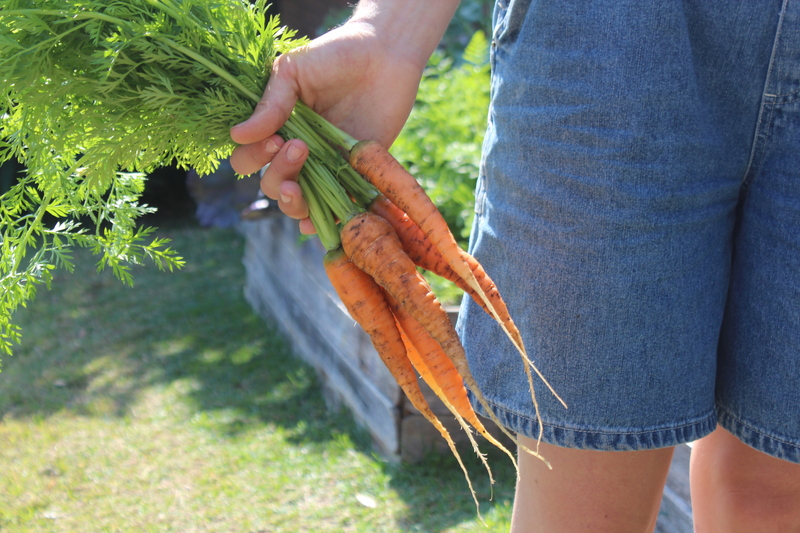 Carrots – Harvesting carrots is like a lucky dip. You never know quite what you’re going to get, but after watching them grow you’ll love them all the same. Carrots are edible at any stage, so if you get them in a little late just serve them as babies. And if you want your carrots to stand out from the crowd, opt for a white, red, purple or gold variety! Radishes – Notoriously fast and easy to grow, radishes should be a staple of every home-grown festive table. They’re beautiful braised, roasted or grilled. Just like beetroot, the tops are nutritious and salad ready! Cherry tomatoes – Or Mother Nature’s lolly. Cherry tomatoes grow abundantly over Summer and are fantastic self-seeders. Sprinkle some seeds in your garden for this Christmas and baby tomato plants will be popping up to surprise you for years to come! Cucumber – Admittedly, cucumber isn’t what most of us are hanging out for at Christmas. They’re essentially crunchy water, so if nothing else you can tactfully offer them to the guests who’ve had a little too much wine. Zucchini – This Christmas, open your loved one’s eyes to the wonder of the zucchini chip. Herbs – Basil, dill & chives will all go well in the warmer months. Turn the basil into pesto, and save the dill & chives for the potato salad! Nasturtium – who doesn’t love edible flowers? These beauties will grow almost anywhere (including in the gaps between your garden beds!). Both the flowers and young leaves make the perfect addition to a Summer salad, or as decoration for dessert.